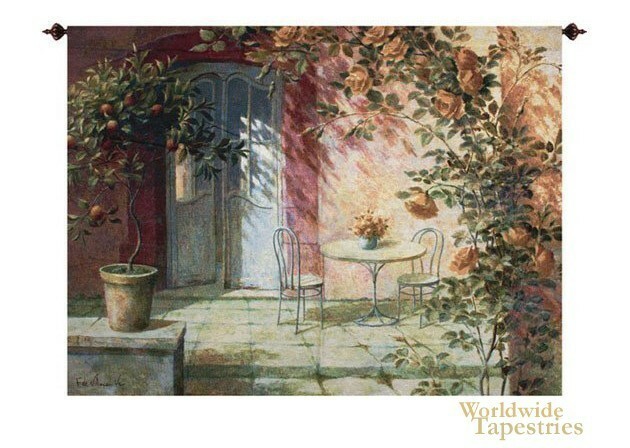 A delightful tapestry showing a patio entrance to a villa. Playful in his use of light, and buoyant in his use of color, this tapestry exudes a charm that is brings delight and nourishment to the senses. Here we see a blue door opened ajar and a table setting just outside with a pot of flowers. Nearby is an orange tree as well as orange roses that decorate the delightful patio. A Mediterranean villa is suggested here in this piece by Fabrice de Villeneuve. Experience the simple beauty and delight of the French country life with this tapestry. This tapestry is backed with lining and has a tunnel for easy hanging. Note: tapestry rod and tassels, where pictured, are purchased separately.